Premiered in 2011, already in its fourth season which will debut on Tuesday, Sept 23, 2014, it is a great TV show that’s sure to keep your interest for a very long time. If you like action flicks, you’re in good company, and even if you don’t, you’ll be surely entertained; each episode is a storyline you’d die – well, not literally – to find out how it ends. 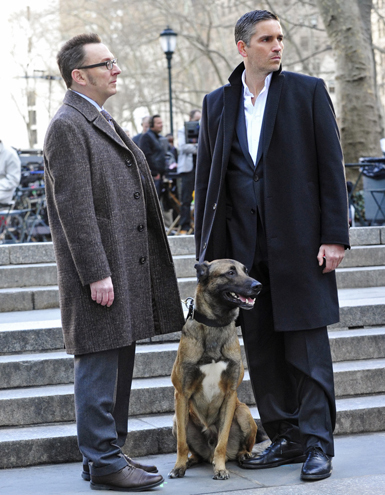 Person of Interest is the story of a billionaire, Harold Finch (Michael Emerson) who has dedicated his life to prevent and fight terrorism, a noble goal, wouldn’t you say? Also a computer wizard, Finch built a sophisticated computer system that can detect acts of terror before they happen, wouldn’t that be nice? Although the system is also able to detect acts of violence, – it has eyes and ears everywhere, much like Eagle Eye – the government for which it was built considers those people irrelevant; Finch was initially okay with the idea until events in his life changed his view. To further his mission, he hired a former CIA operative, John Reese (Jim Caviezel) to attend to the “irrelevant people”. All missions originate with a number (an individual’s social security) the computer system “spits out”. Once the number comes out, it means that the individual becomes a Person of Interest; that individual is tagged to either victimize someone or be victimized by someone. The gist of the missions is to find out the specifics and act accordingly. John does the necessary legwork, watches the individual, talks to him, follows him; in other words, John stalks the Person of Interest. He is also the “muscle” man; with his fine martial art skills and his weapon handling ability, John is hard to beat. Well, he does get beaten sometimes, but usually it’s to get the story moving in a different direction from the audience anticipation. You’d want John to be your bodyguard, really! Finch uses the computer system to “fish for” information, to analyze data and predict the outcome or something close to it. With sophisticated communication system, John and Finch are able to communicate on the go, anywhere during a mission, even while John is in a fight. Pretty cool, huh! To disguise his wealth and his real identity, Finch works at a company as a software engineer; his boss is always up on him, asking for work to be done a little faster. If only they knew what a genius Finch is, in the show that is. In any event, John is handed Credit Cards with no limit. Imagine that. I definitely would like a boss like Finch. Both John and Finch old identities are erased, courtesy of Finch, and they have new ones. Good luck to anyone who tries to find who they really are. Every episode tackles a new problem, and John is always up to the job. By now, you must be thinking whether it’s possible for John to handle all the missions the machine throws at him; fear not. Money is not an issue for Finch. So, he brought in new blood to help with the missions. Then again, he didn’t really have to at first. While following up on a Person of Interest, John found out that detective Lionel Fusco (Kevin Chapman) is a dirty cop; with a little incentive, I mean convincing (more like coercing), detective Lionel had to work with John to bring down bigger fish. It will take some time before Lionel is fully onboard with how he’s helping John, but he will. John is very good at convincing people, I mean coercing; one would say that John has people skill. Joss Carter (Taraji P. Henson), another detective, is just the opposite of Lionel; she wants everything to be done by the book. She is brutally honest and would go to length even jeopardizing her life to get to the truth or to catch the criminal. Her path and John’s (still unknown to her) are crossed several times; eyewitnesses to crimes point to a mystery man who had saved them. John is only known by his beneficiaries as “the man in suit”. In Episode 3, Joss’s hope to capture “the mystery man” was high; John talked to Joss over walkie-talkie; he proposed a place to meet, a public place, a park. Joss positioned all her police resources around the park to make sure John would not escape. Joss was in for some disappointment; instead of John, Joss met at the plaza (courtesy of John) a young girl who was believed to have been killed, along with her family, apparently by a hitman. Joss’ disappointment would not last long however; she’ll have a chance to meet with “the man in suit”; they’ll work together just fine. They have something in common; they both hate to see criminals get away with crimes. As if that wasn’t exciting enough, the show introduced Root (Amy Acker), a character that has close intimacy with the computer system; I know, you never heard of a human intimacy with a machine. I never did either, until now. Exciting, isn’t it? Root is very lucky; she cannot be trapped by the enemy. The machine guides her every step of the way, second by second. Even when she is apprehended, it’s part of the plan. I like watching crime fighters coming out of nowhere to save the day; don’t worry, you’ll have plenty of that with Root. In a scene where John & Company were corned in an office while attempting to save a Person of Interest, all hope was lost. The enemy is ruthless; he doesn’t let anyone live to identify him or lead to him. While John was trying to figure out how he, the others and the person of interest would die, out of nowhere came Root, gun blazing killing everyone in her path. Her secret, the machine tells her where each assailant was hiding. Pretty cool! If you ever feel irrelevant or treated as such or cornered with no one to help, it’s time you call on the team of Person of Interest. They know who you are; they know who is after you. Luckily, they’re equipped to handle any situation. Relax! the team is in the house. As exciting as the show is, Season 3 ended with a preview of what’s coming; another rogue organization (Samaritan AI) coerced Finch – by kidnapping his girlfriend – to provide as much help as needed to set its own sophisticated computer system. With a little help from corrupt government officials – what else is new? – the rogue organization now has full access to government data warehouse, and it too can now see and hear everything. It’s safe to imagine there will be a showdown between the rogue organization and Finch’s team in Season 4. Fear not! The rogue organization has evil agendas; evil cannot prevail in Finch’s world. Brace yourself for another wild season of Person of Interest.